Take advantage of the great weather we&apos;ve been having by enjoying some quality time with the family. Ellis Park in Danville is hosting a Family Campout on Friday evening. For the low cost of $10 per family, you can enjoy hot dogs, s&apos;mores, games, and an outdoor movie. Bring your own tent and sleeping bags, and be sure to pre-register! 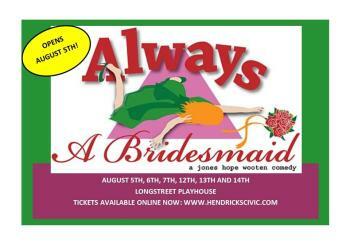 A hilarious story of friendship opens this weekend at the Hendricks Civic Theatre. Always A Bridesmaid tells the story of four friends who strive to keep the promise they made in high school by being in each other&apos;s weddings -- no matter what. The show is playing this weekend and next at the Longstreet Playhouse in Danville. Tickets are available at the box office and online. There are only two more First Friday Cruise-Ins this summer! Come out to the Courthouse Square in Danville and check out the antique and muscle cars on display. You may want to check these cars out on your way to a movie at the Royal Theater or a yummy dinner at Pizza Paradise! These are just a few ideas to get you started. For more fun, be sure to check out our Hendricks County Insider Blog and Event Calendar. Whatever you do, be sure to get out and make some memories in Hendricks County this weekend!